By differentiating between exterior silence and interior silence, we see that although exterior silence promotes interior silence, silence of speech, gesture, or activity finds its full meaning in the search for God. This search is truly possible only in a silent heart. 53. Mother Teresa had an intimate knowledge of silence. She had had the hard experience of God’s silence, like Saint Teresa of Avila, Saint John of the Cross, and Saint Thérèse of Lisieux. She was a woman of silence because she was a woman of prayer, constantly with God. She wanted to remain in the silence of God. This nun did not like to speak and fled the storms of worldly noise. Mother Teresa enjoyed incredible esteem all over the world, and yet she preserved a childlike spirit. She imitated Christ in his silence, humility, poverty, meekness, and charity. She loved to remain in silence for hours at a time before Jesus present in the Eucharist. For her, to pray was to love with the power of silence all her heart, with all her soul, and with all her strength; it was to give her whole being and all her time to the Lord. The most beautiful offering that she wanted to make of herself, and of all her activities on behalf of the poor, was to devote long intervals in her day to a heart-to-heart conversation with God, so that those moments of intimacy might allow her heart to swell with an unconditional love. Like Jesus, her heart always thirsted for love. Jesus’ cry “I thirst” is inscribed in all the sisters’ chapels of the Missionaries of Charity. 54. 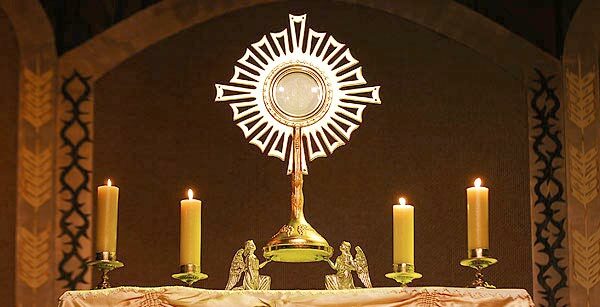 For my part, I know that all the great moments of my day are found in the incomparable hours that I spend on my knees in darkness before the Most Blessed Sacrament of the Body and Blood of our Lord Jesus Christ. I am, so to speak, swallowed up in God and surrounded on all sides by his presence. I would like to belong now to God alone and to plunge into the purity of his love. And yet, I can tell how poor I am, how far from loving the Lord as he loved me to the point of giving himself up for me.